Early in Barack Obama’s presidency, veteran Maryland campaign manager Larry S. Gibson would often think of the political pioneers he worked with through the decades who never got a chance to witness the election of the nation’s first black president: Joseph Howard, the first black judge elected to Baltimore’s Circuit Court. Parren Mitchell, Maryland’s first black congressman. Milton Allen, Baltimore’s first black state’s attorney. With Obama’s presidency entering its final weeks, many African-Americans are caught in a swirl of emotions. There is palpable pride and a lingering sense of wonder that the nation elected and re-elected a black president — a towering achievement long dismissed as inconceivable. A recent poll by the Pew Research Center found that 62 percent of black Americans ranked Obama’s election as the most significant historical event in their lifetime. There is also a touch of sorrow at the departure of a trailblazing and popular president who acknowledged the work of black athletes, black artists and black intellectuals and by his presence validated the lives of black people in ways that his 43 predecessors could not. 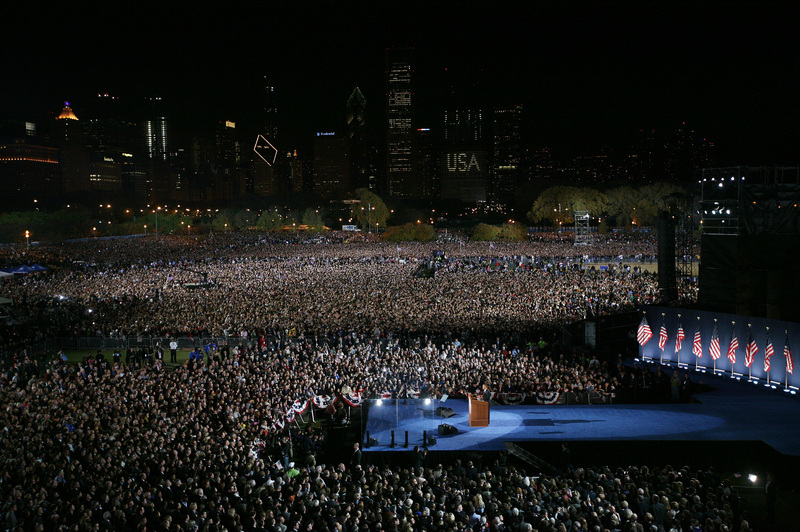 U.S. President elect Barack Obama gives his victory speech to supporters during an election night gathering in Grant Park Nov. 4, 2008, in Chicago. Tributes to Obama and videos of children bursting into tears at the thought of his leaving office abound on social media. But it is striking that many African-Americans are not mourning the president’s impending departure, even if they are nervous about where President-elect Donald Trump will take the country. Instead, they are proudly reflective as they look back on a presidency they believe was conducted with intelligence and dignity and moved the country closer to its ideals. Overall, 57 percent of Americans — and more than 9 in 10 African-Americans — approve of the job Obama is doing in office, according to a recent Gallup Poll. As the Obama presidency draws to a close, Worthy has her doubts about where race relations in the country are headed. But her hope is bolstered by her own family’s journey. Her father, Walter Morris, was a member of the all-black 555th Parachute Infantry Battalion, based at Fort Benning, Georgia, during World War II. Back then, black troops could not eat meals with their white counterparts, even though German and Italian prisoners of war could. Perhaps more infuriating was that the “Triple Nickles” were not allowed to fight in the segregated Army. Instead, they made their mark as smoke jumpers who parachuted out of planes in remote areas to stop the spread of deadly wildfires, mostly in the Pacific Northwest. Growing up in Brooklyn, New York, in the years after the war, Worthy would often spend summers with her grandparents in Waynesboro, Georgia. Each visit came with the same warning about white folks: Don’t look them in the eye. Don’t speak to them unless they speak to you first. So a half-century later, it felt like the entire world had been transformed when the United States elected a black man as president. “For me, it said I am accepted as a human being and I am valued. For both my father and I, it was affirming,” she said. “Once he lived to see a black man elected, he would joke that he wanted to live long enough to see him elected a second time.” That, he did. Morris died in 2013, nine months into Obama’s second term — doubly affirmed. Now for millions of young people, a black president is all they ever really knew. Seeing an endless stream of images of a black first family, and feeling a familial connection to the president himself are things that Ivy Harrington, 22, a senior guard on Morgan State University’s basketball team, said she will miss. Shannon Dotson, 22, student body president at Bowie State University, followed Obama’s presidency from the start. He stood in the frigid cold at a rally the president held in Baltimore days before his 2009 inauguration. And he was among nearly 2 million people who crowded onto the National Mall to witness Obama’s historic swearing-in. Now that the president’s second term is almost up, Dotson said, he is a little sad. But mostly he feels empowered by Obama’s achievement. It is a feeling widely shared both among people who worked closely with Obama over the years and those who simply admired him from afar. Ifill, of the legal defense fund, estimated she has attended about a dozen working meetings where the president was present. Most often, she was in the role of advocate and adversary, nudging Obama to do more about police brutality, or to be more generous with his health care reform proposals. Sometimes she left satisfied. Other times she did not. Yet, every time she left feeling a special pride in her president. 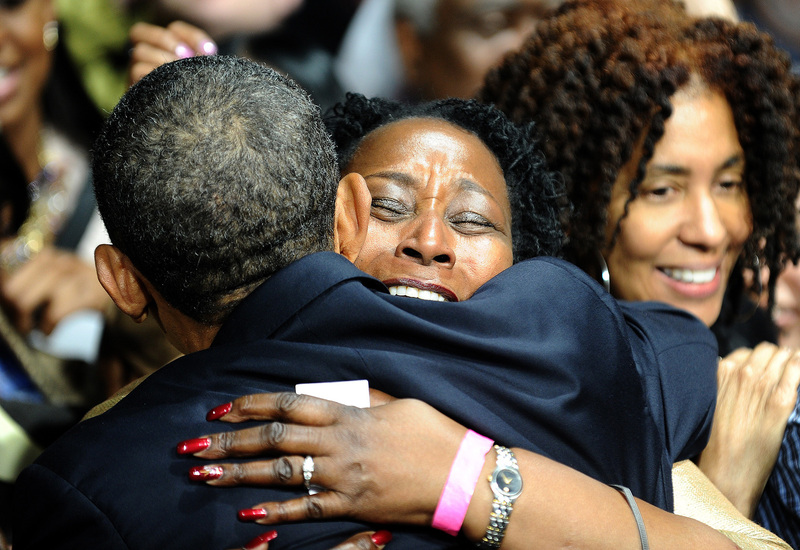 US President Barack Obama greets supporters after addressing a campaign event at the University of Illinois at Chicago Jan. 11, 2012. Obama’s example resonated far beyond the vaulted corridors of Washington, often empowering workaday people as they confronted their daily challenges. Carnell Mayo, owner of a small pest control company in Baltimore, credits Obama’s example for giving him the confidence to persevere with his business when things were shaky. It also made him optimistic. Mayo opened his business in 2004 after working for another pest control company for 12 years. He mustered the courage to start the company after pulling over in his truck one day to add up the invoices for his day’s work. The numbers were eye-popping. He started with one truck and little cash, and by the time Obama was elected, he was barely holding on. But Obama’s success steeled Mayo’s determination to succeed as well. He went to more trade conventions, implemented more marketing, and now the business is flourishing. He’s about to hire a full-time employee and he has deployed a second truck. “It is amazing to say, but having a black president changed my entire outlook,” he said. If Obama’s election was affirming for many African-Americans, what does it mean that he will soon be replaced by Trump, who has emboldened xenophobes and white nationalists with his statements about Mexicans and Muslims? The Southern Poverty Law Center, which tracks extremist activity, has fielded more than 1,000 allegations of racial and religious harassment in the month following Trump’s election. Some have speculated that the country may be living through a period analogous to the end of Reconstruction, a moment when racial progress is snatched away and followed by a new form of repression, like Jim Crow segregation replaced slavery. Others, including some of those closest to Obama, are not so dire. Still, they are pessimistic. Obama’s top White House confidante Valerie Jarrett called Trump’s victory “like a punch in the stomach” and “soul-crushing.” In an interview with Oprah Winfrey on CBS, first lady Michelle Obama observed that the national mood now is far different from when her husband won his elections. “Now we’re feeling what not having hope feels like,” she said. Yet not everyone is discouraged. Rep. James Clyburn, 76, who grew up amid segregation in South Carolina and came of age during the searing civil rights battles of the 1960s, sees Trump’s victory as part of a long pattern in which the country’s voters have followed relatively progressive leaders with more conservative choices. From his vantage point as one of the top Democrats in Congress, Clyburn said he always admired Obama for his focus as he led the nation through the Great Recession, worked to save the auto industry, and expanded health care coverage to tens of millions of Americans. He also watched Obama steer through a racial minefield that might have blown up less nimble leaders. In 2009, when Clyburn’s fellow South Carolina congressman Joe Wilson, a Republican, rudely interrupted Obama’s speech to a joint session of Congress by yelling, “You lie!” Clyburn pressed for and got an official censure of Wilson. He did so despite the urging of Obama, who Clyburn said wanted him to drop the whole thing to keep the nation’s focus on health care reform. “I think Obama felt and probably still feels that to the extent to which you can stay out of the issue of race, you are much better served,” Clyburn said. “I don’t buy that. The whole foundation of this country was built on racial difference. I don’t think you solve problems by pretending they don’t exist.” Still, he respected the president’s approach, he said. 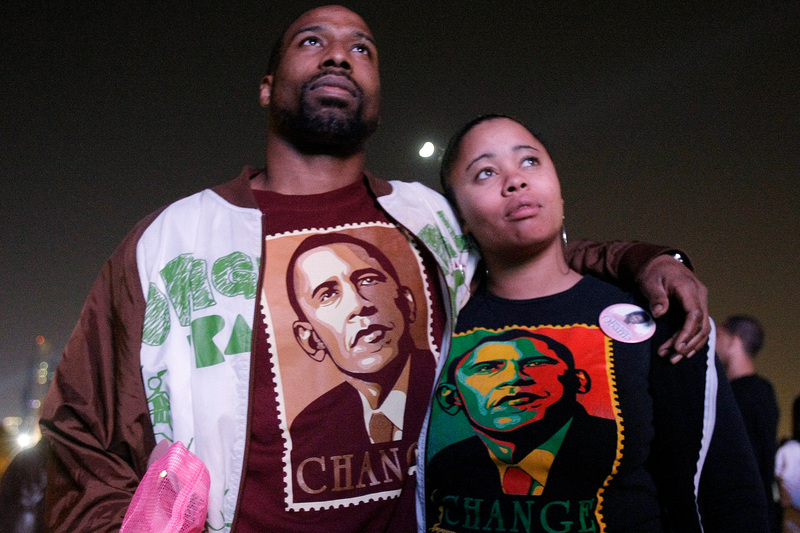 Gregory McGee, left, and Jakeeta Stubblefield from Chicago, supporters of Democratic presidential candidate Sen. Barack Obama, D-Ill, watch election returns on a big screen TV in an overflow area of Grant Park Nov. 4, 2008. Some say there would be no Trump without Obama, and all that implies about racial backlash. But the presidency has swung left to right and back again for much of the nation’s history — even if it feels like the swing to Trump is unlike anything we have experienced in modern times. Seeing the first black president complete his term is actually cause for celebration, he said, and worth the price of whatever lies ahead.